Chiral materials do not have a center of inversion symmetry. Left and right handed versions of the material are distinct. Chiral materials are also called hemitropic or noncentrosymmetric. Some material properties such as piezoelectricity and pyroelectricity can only occur in chiral materials. Classical elasticity makes no distinction between chiral and non-chiral materials but generalized continuum theories such as Cosserat elasticity do make such a distinction. Curiously this subject has recently become popular. Our research in this area is summarized below: the first prediction of stretch twist or squeeze twist coupling in an elastic solid represented as a continuum. Rod Lakes and Robert Benedict, Noncentrosymmetry in micropolar elasticity, International Journal of Engineering Science, 20 (10), 1161-1167, (1982). A solid which is isotropic with respect to coordinate rotations but not with respect to inversions is called noncentrosymmetric, acentric, hemitropic, or chiral. Chirality has no effect upon the classical elastic modulus tensor. In Cosserat elasticity, chirality (hemitropy) has an effect. A chiral Cosserat solid has three new elastic constants in addition to the six considered in the fully isotropic micropolar solid. The chiral micropolar solid is predicted to undergo torsional deformation when subjected to tensile load. Thus chiral solids have different mechanical behavior from solids with a center of symmetry, as allowed by the more general Cosserat elastic theory. The theory predicts coupling between stretching and twisting. Prall, D. and Lakes, R. S., Properties of a chiral honeycomb with a Poisson's ratio -1", Int. J. of Mechanical Sciences, 39, 305-314, (1997). A theoretical and experimental investigation is conducted of a two-dimensionally chiral honeycomb. The honeycomb exhibits a Poisson's ratio of -1 for deformations in-plane. This Poisson's ratio is maintained over a significant range of strain, in contrast to the variation with strain seen in known negative Poisson's ratio materials. This is the first two-dimensional metamaterial that is chiral; we did not call it by such a name. Chiral three-dimensional isotropic cubic lattices with rigid cubical nodules and multiple deformable ribs are developed and analyzed via finite element analysis. 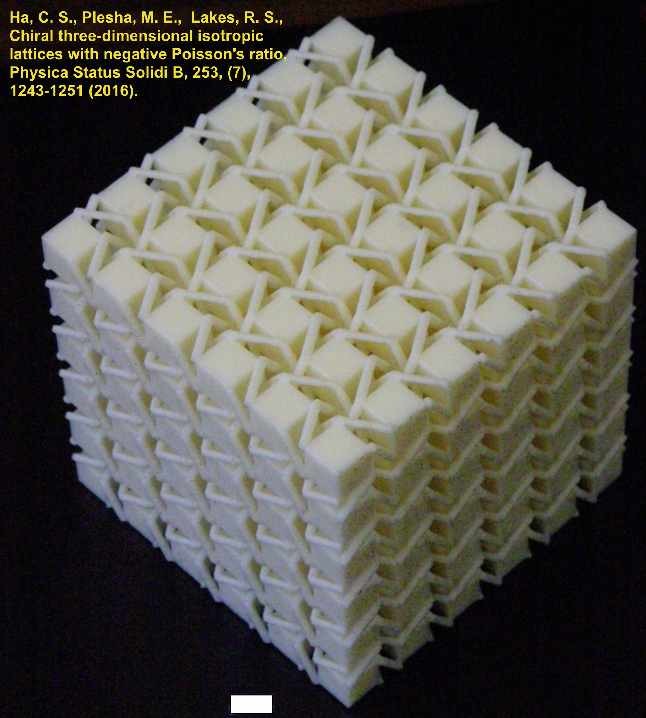 The lattices exhibit geometry dependent Poisson's ratio that can be tuned to negative values. Poisson's ratio decreases from positive to negative values as the number of cells increases. Isotropy is obtained by adjustment of aspect ratio. The lattices exhibit significant size effects. Such a phenomenon cannot occur in a classical elastic continuum but it can occur in a Cosserat solid. The material exhibits squeeze-twist coupling and stretch-twist coupling. Coupling of this type cannot occur in classical elasticity. Lattices with this property are made by 3D printing. See also Poisson main page. These lattices are also known to be Cosserat solids; see Cosserat page, (2016). The 3D lattices are made by 3D printing.